Curved monitors are all the rage these days. From gaming to working professionally, these curved displays take the experience to the next level. While some are designed for meeting only a specific purpose, others are multi-faceted, capable to satiate multiple requirements. 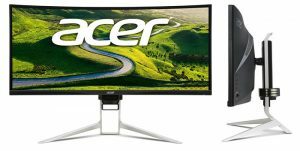 Less than 4K but more than 2K, Acer XR382CQK finds an excellent middle ground between the two display ranges that scales nicely on the 37.5-inch curved monitor. The accompanying stand offers a -50 to 350 of tilt and up to 600 of spin for finding the right viewing angle. 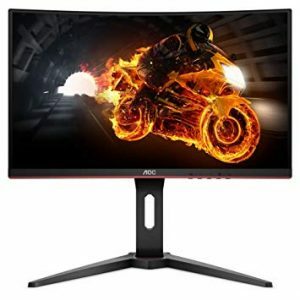 Although build to provide a rich gaming display, the highly accurate colors make the Acer curved monitor apt to be used for professional photo and video work. 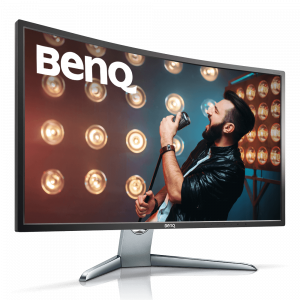 The UltraWide QHD display technology offers 100% sRGB range with 6-axis color adjustment. The HDR technology offers deeper levels of black and white contrast for providing more lifelike colors. To make things even better, Acer XR382CQK comes with a pair of built-in 7-watt DTA speakers. It’s been several years since Asus has started producing superb gaming gear under its ROG (Republic Of Gaming) brand. 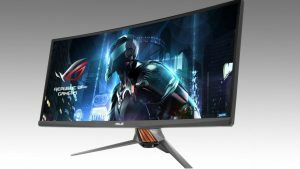 One of the recent additions to the lineup is the Asus ROG SWIFT PG348Q curved monitor. The viewing angles are simply excellent for gaming. Although the screen curve isn’t as sharp as that in other gaming displays, it is more than enough to meet peripheral gaming vision requirements. For the price-tag, the contrast ratio, color saturation, and refresh rates are superb. Unlike other curved monitors, Asus ROG SWIFT PG348Q comes with a joystick at the back right of the monitor for navigating the menus. The most important letdown for the curved monitor is the unimpressive dual inbuilt 2W speakers. Once replaced, you are in for a truly amazing experience. The Benq EX3200R is one of the best, and scarce, options for those buyers looking to shop for a curved monitor in a budget. For its price, the curved monitor from the Taiwanese tech product maker packs a range of good features. Although not many Premium features are available on the budget monitor, the Benq EX3200R comes with a nice display, good contrast, and height adjustability. Thanks to the inclusion of support for FreeSync, the curved monitor also makes up for a good choice to gamers. 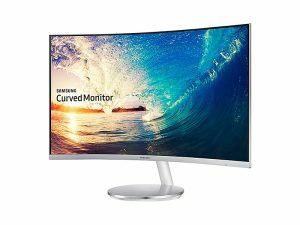 Supporting a 1080p resolution and low color range makes the curved monitor unbefitting for graphics professionals. Also, to achieve a budget price-tag, the curved monitor cuts down on the total number of ports available. However, being almost half-priced than the high-end displays, such limitations are perfectly acceptable. The 27-inch AOC C27G1 is the new gaming curved monitor on the block. Though supporting a budget price-tag, the curved display packs surprising features may it be the 144 Hz refresh rate, 1ms response time, or the support for AMD Free Sync. Supporting a subtle curve, the AOC C27G1 is a compact curved monitor that can easily cope up with less than 30-inch space requirements. Thanks to the 1800R curved monitor wrapping, the curved display is able to offer a truly immersive gaming experience. The 3-sided frameless design with ultra-narrow borders flaunted by the AOC C27G1 makes up for a straightforward yet robust multi-monitor setup. The gaming-oriented curved display comes with a DisplayPort socket, 2 HDMI ports, VGA inputs, and an audio line-out. 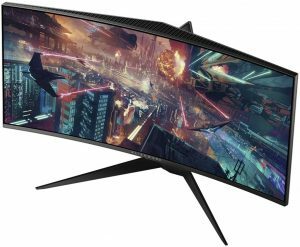 The AW3418DW curved monitor is the recent addition to the Alienware gaming gear lineup from Dell. With its wide-viewing angles, the Dell Alienware curved display succeeds in offering a truly immersive experience. The curved monitor is appropriate for working and watching movies too. The big 34-inch screen allows you to multitask by placing two almost full-sized windows simultaneously. Thanks to extremely fast response time and a flicker-free backlight, the Dell AW3418DW is able to perfectly project even the most graphically advanced video games. Dell AW3418DW has a very low input lag, a wide aspect ratio, 4 USB 3.0 ports, an HDMI port, and a DisplayPort socket, that makes it excellent for working despite being endorsed as a gaming monitor. 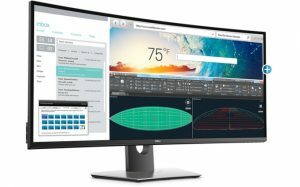 Typically, 34-inch and 38-inch curved monitors are the most popular choices. However, if you’re looking for something bigger, then the 49-inch Samsung CHG90 might be what you need. 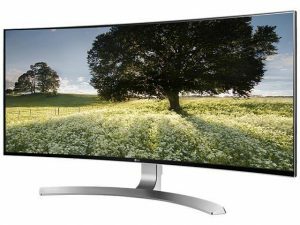 The big curved monitor manufactured by Samsung is bigger than anything available in the market right now. Samsung has endorsed the CHG90 mainly as a gaming monitor, though it is capable of other things too. The gigantic 49-inch is not only big enough to work on several projects sharing the same display screen but also offers a more immersive gaming experience to the gaming nerds. The only major drawback of the Samsung curved monitor is that it isn’t able to present crisp fonts which is obviously due to its humungous size. Nonetheless, for gamers and entertainment lovers looking for a bigger and better-curved monitor, Samsung CHG90 is definitely the pick. One of the best-curved monitors offered by LG is the 34-inch 34UC98-W. 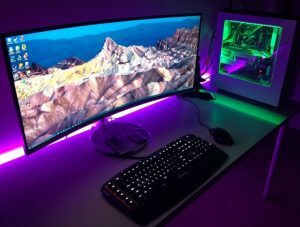 In addition to supporting an almost perfect calibration, the curved monitor features several presets to jump between gaming, theater, work, and other display modes. Addition of the built-in 7-watt speaker duo to the monitor produces an impressive sound that perfectly complements the display produced by the monitor and makes up for a ready-to-go entertainment platform. The accurate color display is excellent for entertainment as well as working with graphics. Although the curved monitor from LG comes with a USB 3.0 port with fast-charging support, two HDMI ports, dual Thunderbolt 2 ports, and a DisplayPort, the main highlight is the height and tilt adjustment stand which is typically an overlooked feature even for a curved monitor. Thanks to a larger 38-inch screen and higher resolution, the Dell U3818DW curved monitor is ideal for adding to your work desk. However, that doesn’t mean that you can’t use the big 38-inch curved display as a gaming monitor or for binge-watching movies. In addition to having a subtle curve, the Dell curved monitor features a unique connection system allowing you to connect as well as control 2 computers simultaneously with only a single pair of keyboard and mouse (KVM feature). Dell U3818DW is able to connect up to 6 RF-enabled or Bluetooth 4.0-enabled devices. For transmitting power, audio, and video from a laptop or PC, the curved monitor comes with a single USB Type-C cable. The 27-inch Samsung C27F398 curved monitor is designed with compactness and space-saving in mind. Thanks to its smaller size, the curved display is able to fit into spaces less than 30-inches. Being small, the Samsung curved monitor also saves you a few bucks too. In addition to sacrificing some screen space, Samsung C27F398 also has lesser brightness, 250 nits, and a lower resolution. Nonetheless, it flaunts the proprietary EyeSaver technology that can be found in pricier displays from Samsung. Obviously, Samsung C27F398 doesn’t come with inbuilt speakers. Instead, it has a 3.5mm jack to let you plug in earphones, headphones or a home theatre system. The curved monitor has 1 HDMI port, 1 DisplayPort socket, and comes with a 6 feet long HDMI cable. 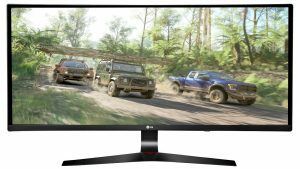 Look no further to the 34-inch LG 34UC79G-B if you’re looking for a multi-purpose curved monitor that has plenty of good features and doesn’t being offered at a premium price. The curved display is fitting for playing games, going on a movie binge, and doing important work. Though the 34-inch curved monitor from LG doesn’t have the highest resolution available, its wide range refresh rate and 21:9 aspect ratio assures of having a superb gaming experience without the need of the latest high-powered graphics card. Only 3 inches thick, LG 34UC79G-B supports an attractive design and is height-adjustable. It comes with the usual DisplayPort, HDMI, USB, and audio ports. A DisplayPort cable and HDMI cable comes complimentary with the curved monitor. That sums up the list of the 10 best-curved monitors to get in 2019. Have you decided to buy any of the picks? Or have you already got one mentioned on the list? Let us know via the comments section below.